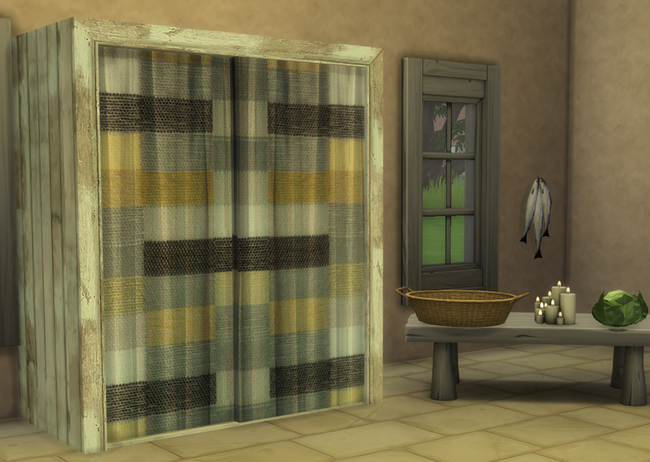 I needed more big rugs so here are five for your Sims rooms. 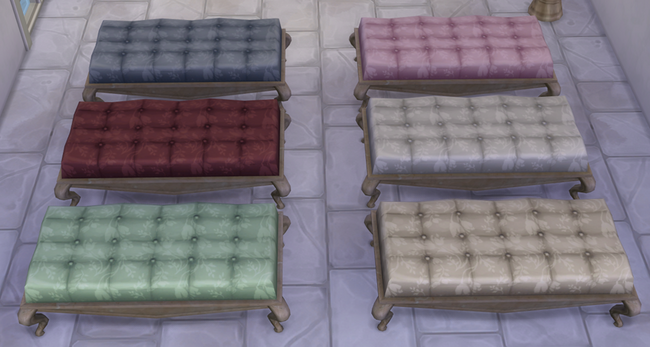 Four long velvet pile and one modern pattern. Cloned from the giant one so they are £800 because I forgot to lower the price. I hope they are useful. Balloon dog on back of sofa by Joolster candles by OM, Lights beside bed a download I've lost the name of, all other clutter me. It was hot here a while back and all I could think of was how in the Mediterranean all the furniture, walls and floors were cool, cool marble. So here's a collection of bedroom furniture that borrows from Roman & Greek design. 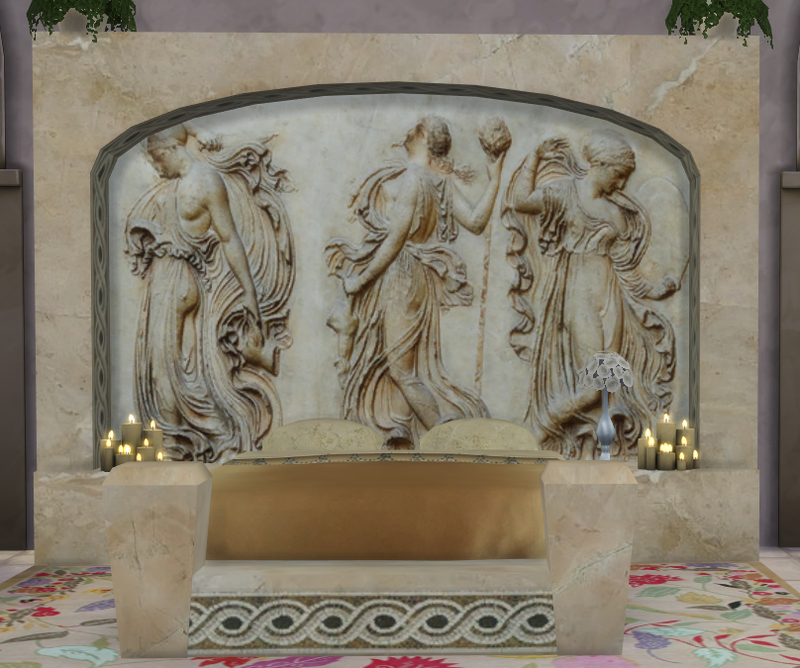 The Julius Bed comes in three designs, the white and gold have original Roman relief’s as headboards, the peach has a picture by Leighton; Gate Of Dawn. The bedding is silk all designed by myself. The bed has slots wherever there is a flat surface, it also has great specs energy 8, stress 6, relief uncomfortable 8. Low poly; vertices-747 polys 800, mostly the bedding. Sells for £800. 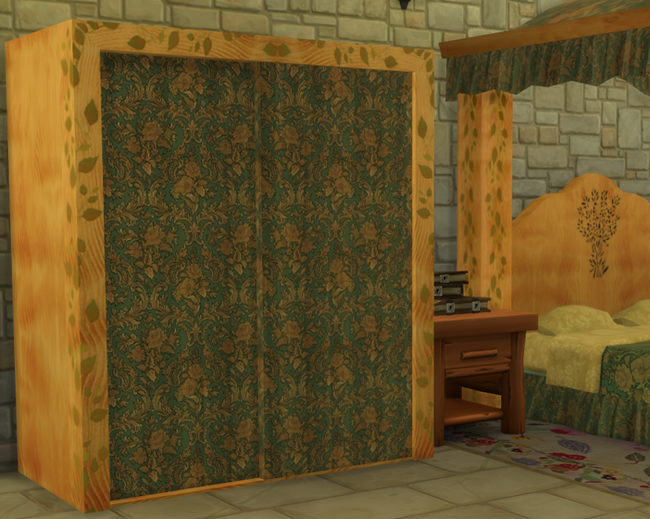 After the recent updates this bed stopped working in my game, so I have updated it and now it works fine. 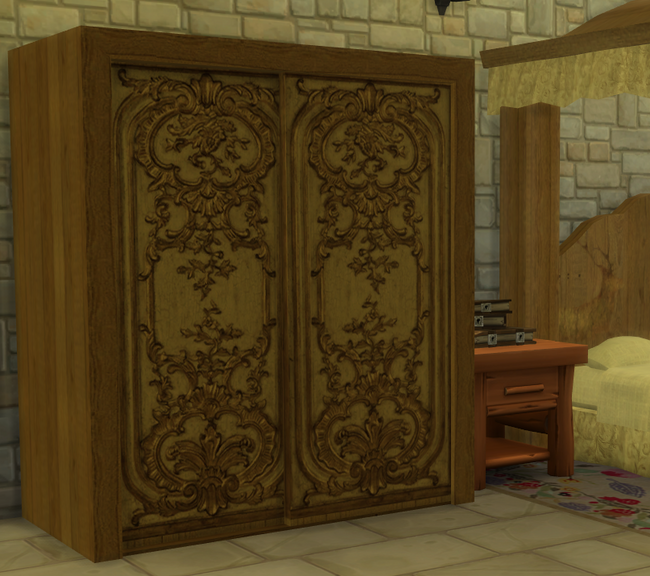 The DL link has been updated so the bed available now is not the one you may have. If it's working great if not delete the old file and replace with this one. 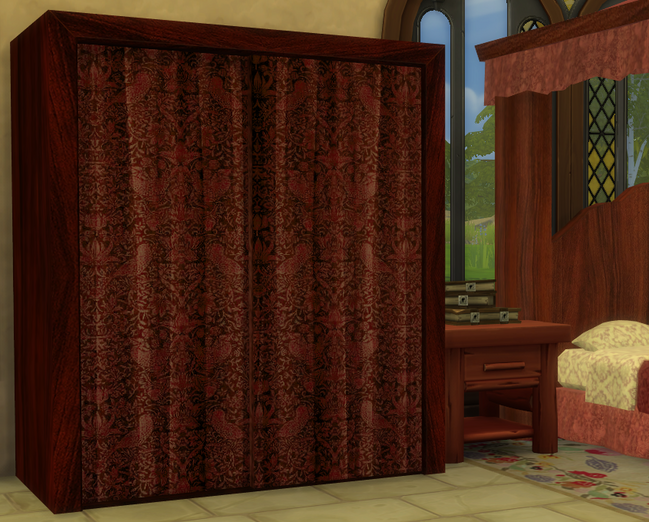 I thought that a bed like the Julius needed a closet that was in keeping with the size and impact, so I re coloured one of the walk in closets. 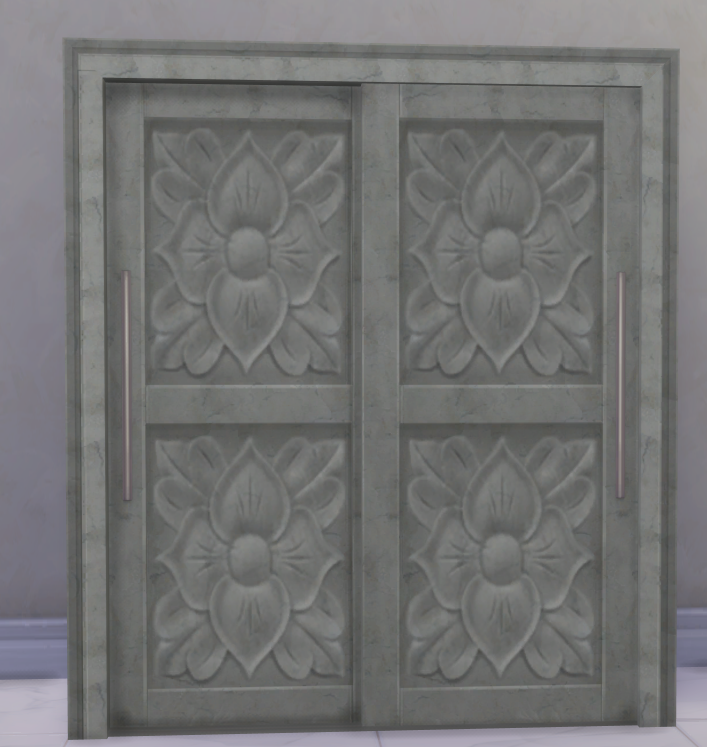 This is the smallest one, I changed the door mesh so that instead of having panels it's smooth so I could add whatever design I wanted. 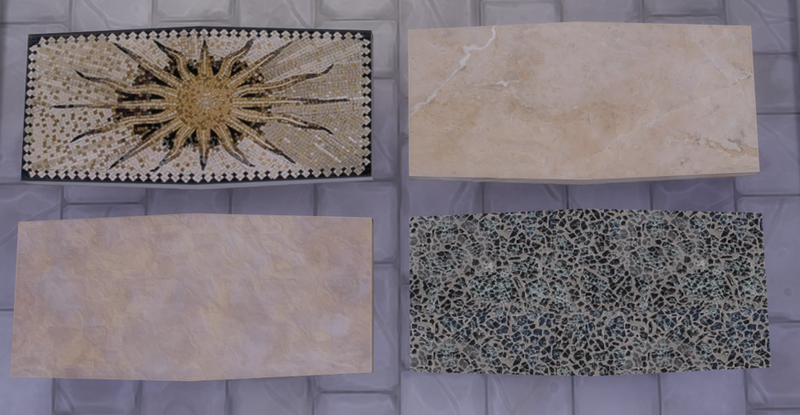 The same three textures as above, white, gold and peach. £730. 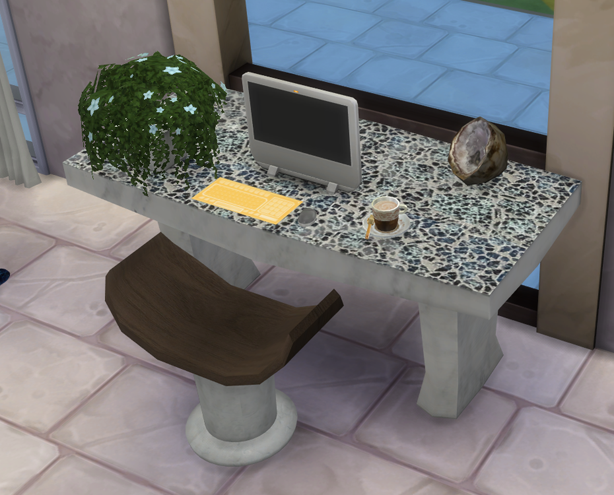 A small table to gather clutter in bedrooms or anywhere else inside or out. 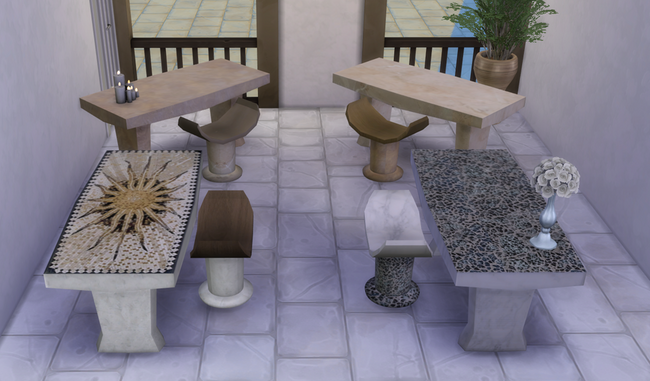 Marble is totally weatherproof :-) Four colours, white, gold, peach and white with blue a mosaic top. 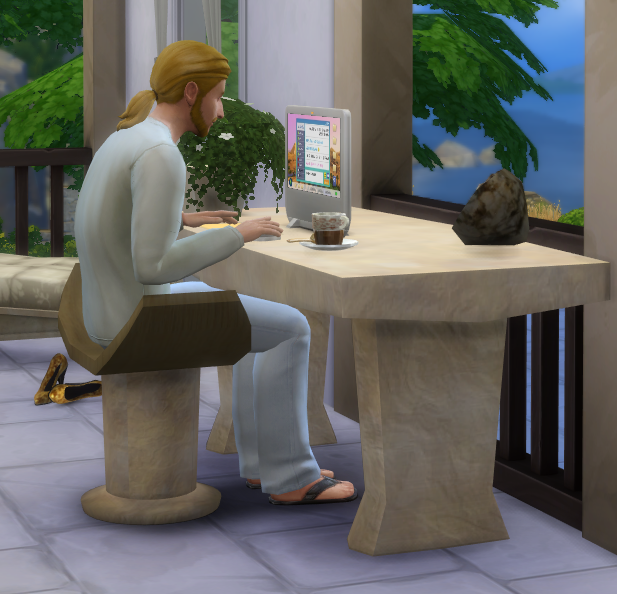 Cloned from the rock coffee table I suspect came with Outdoor Retreat. 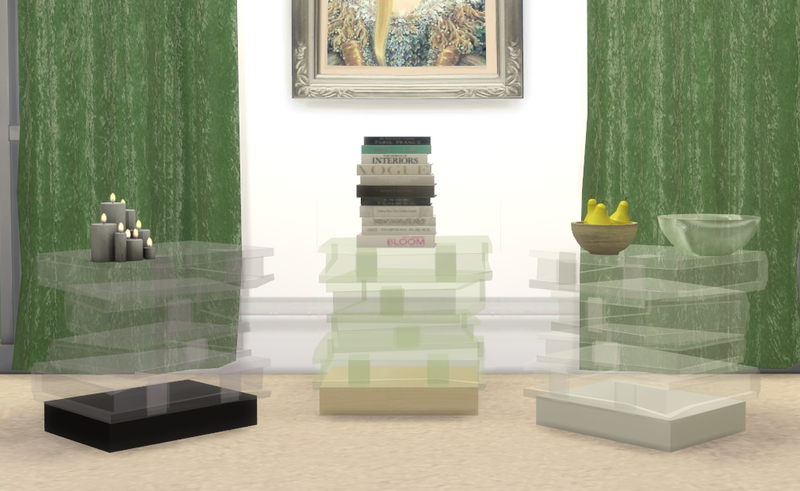 Mesh by me; very light Verts 124, Polys 114. Price £75. Marble Dining Table/desk/dressing Table and Chairs. 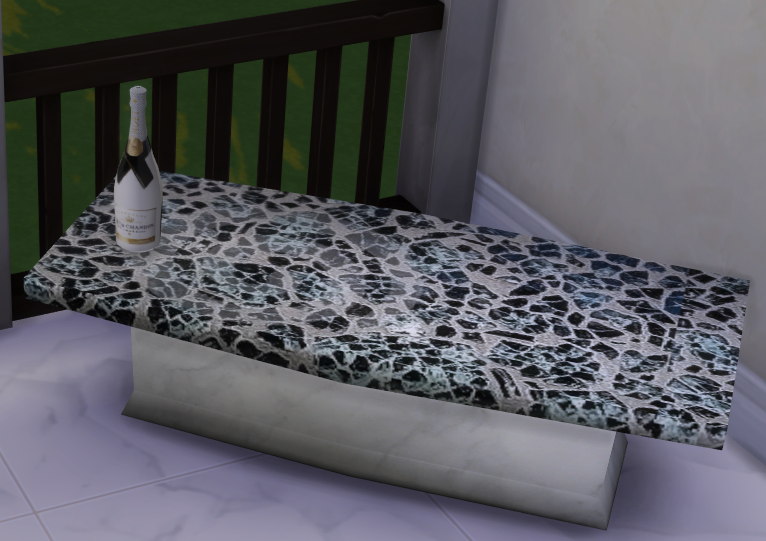 I made this table with a dressing table in mind or a table for guys in the bedroom, but after I put it together I realised it could be used for any of the above. 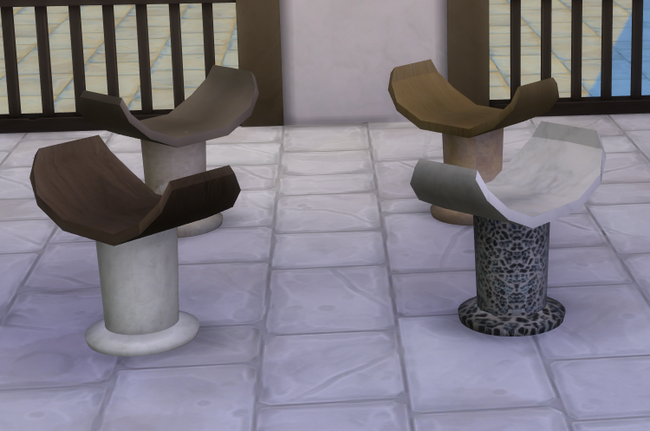 These are my first chairs, they are based on a picture of some Roman chairs I found on line. All the seats are wood except for the blue mosaic one which is white marble. 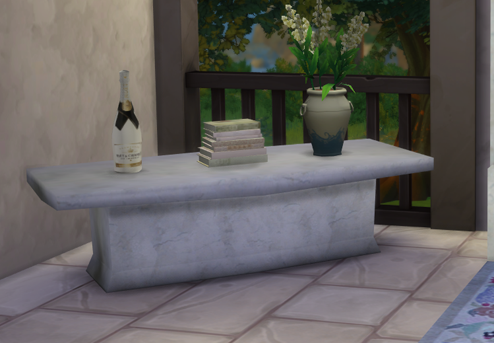 The table and chair textures match the rest of the Roman Collection and the table design is a larger version of the above coffee table. Table £375 Chairs £180. Both are separate files in the zip. 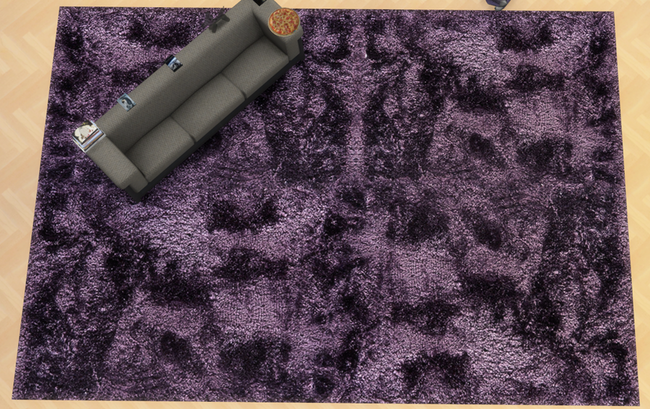 I re coloured this to match the bedroom furniture as it seemed to fit with the above bedroom design. 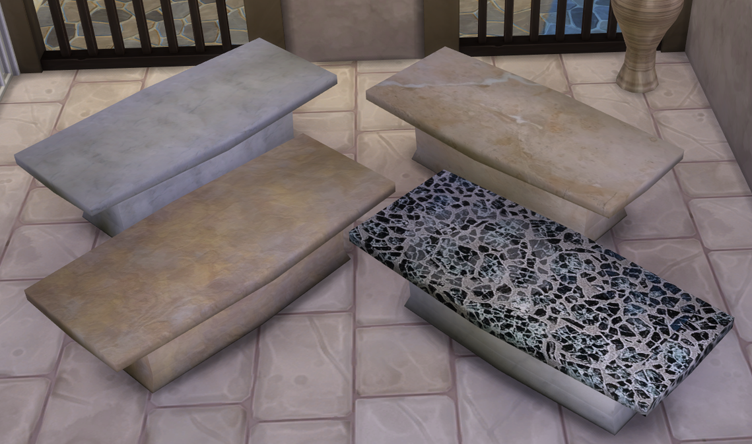 This is an odd re colour there are 14, 7 each of silvery and gold marble bases; some of the tops have been re coloured and some I left as I like the colours as they were. When finding the right colours in game its a case of clicking until they show. 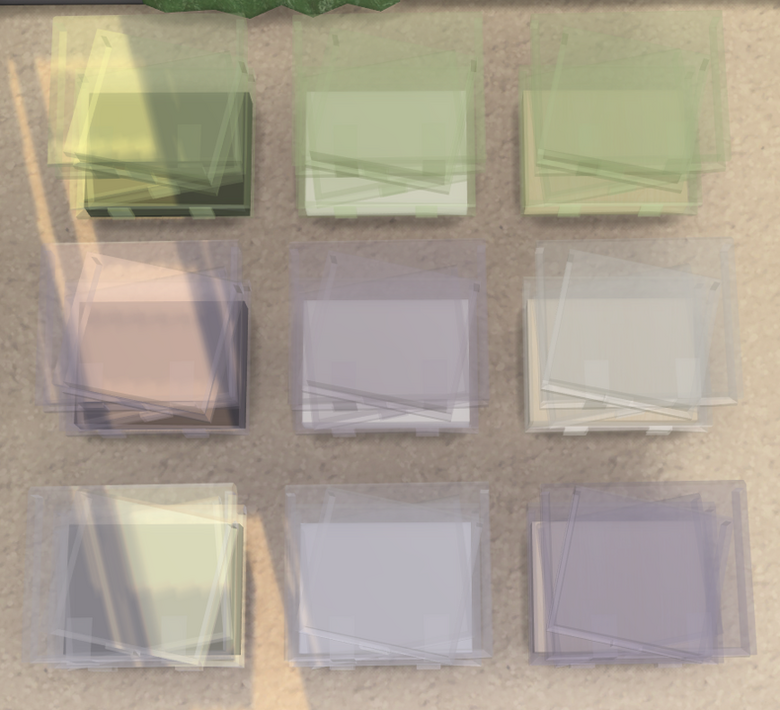 I put the right colours in the swatches but they show as the originals in my game. I'm sorry but I have no idea why, the re colours are there though. £200. 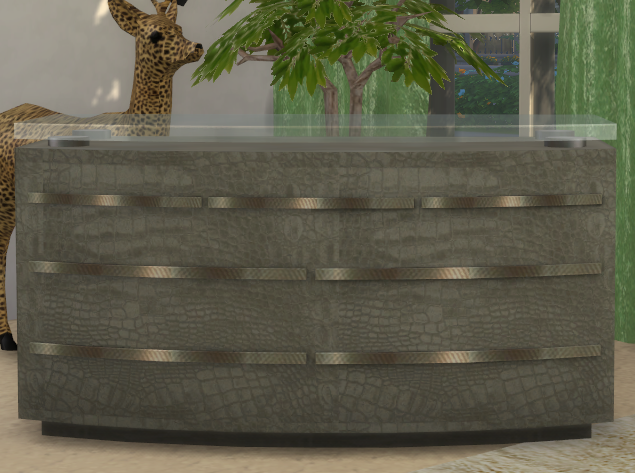 The newest game update (especially the lighting) has prompted me to look at some of my older objects and update or revamp them. I have learnt a lot in the last few months and this should reflect in everything I post here. 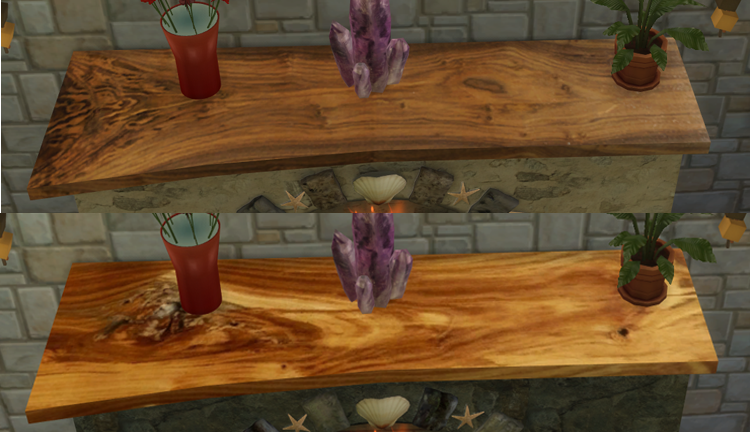 So here are some updates on the glass objects, all have updated specs which gives the objects a richer shine and more even colour. starting with the large Chanel Bottle. 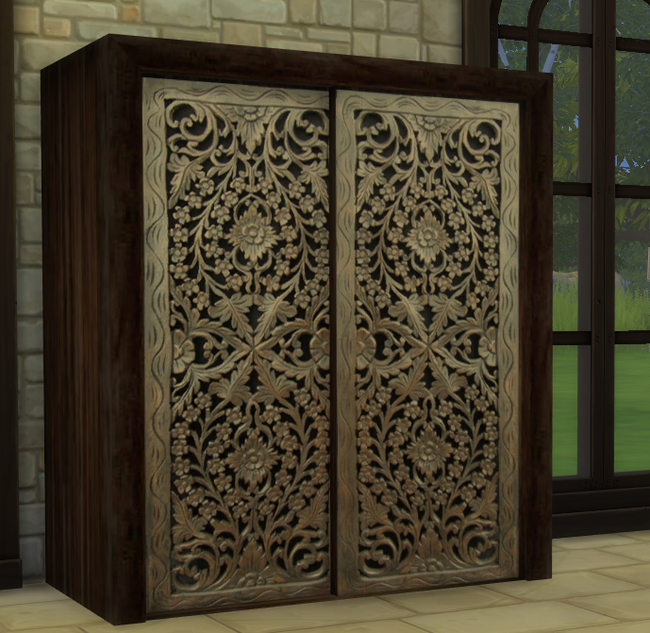 This has had a complete strip down and rebuild, its lighter and smaller with a much smaller footprint and now has three slots for your plants, shoes, discarded clothes. 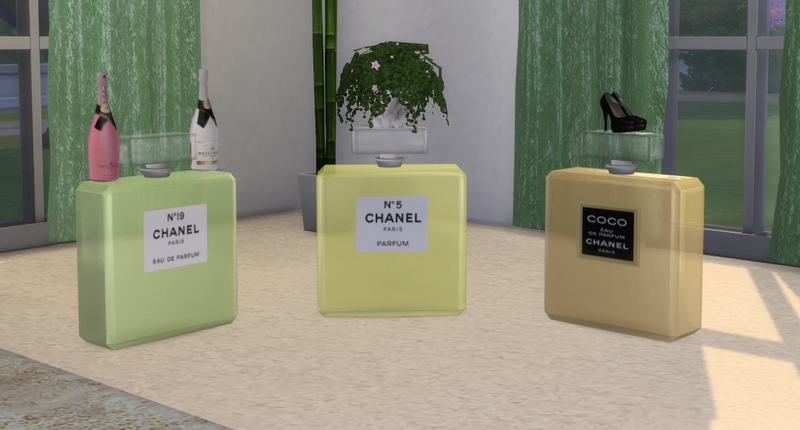 Plus I added two more perfumes that shared the same bottle design. 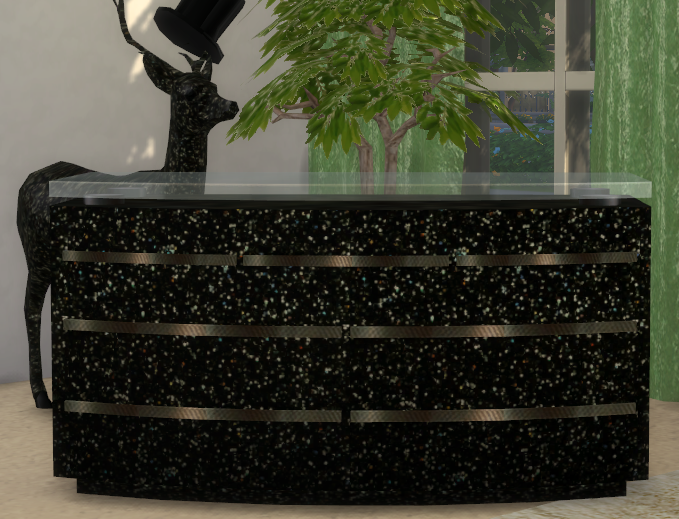 This is one mesh that is really earning its keep as you will see from the below post. I advise deleting the old file and replacing it with this new one. Both bottle sizes are in the zip so you can choose what you want to use. I hope you like the new changes. 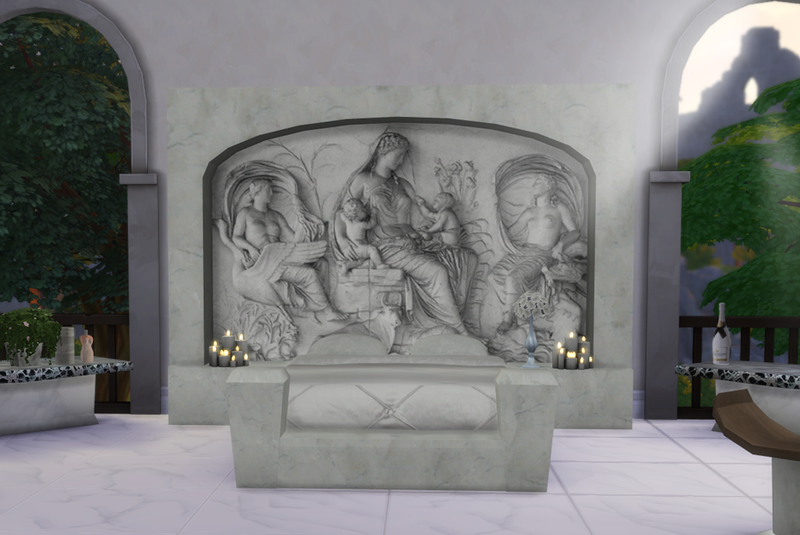 Credits; Cassandra pumps by Mio Sims, everything else me. This lamp has also had the mesh replaced and the two additional perfume colours added. I have changed the light colour to antique white. To make the lamp look like the pictures and match the bottle colour I changed each ones colour and dimmed the brightness until I was happy with it. The pictures show the lamp as they are and after I changed the colour and brightness. 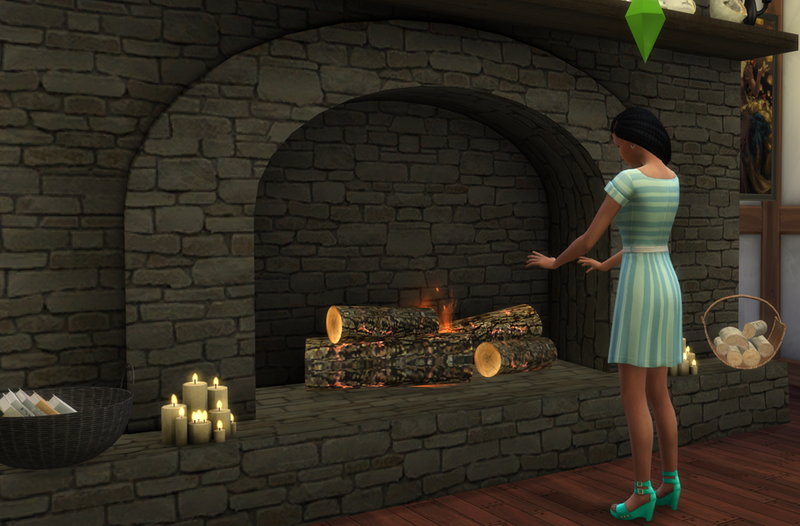 The flirty ambiance is still available if you want to use it. Delete the old file and replace with the new one. The lamp before custom colour and brightness changes. changing from white to coffee, yellow and lime green. 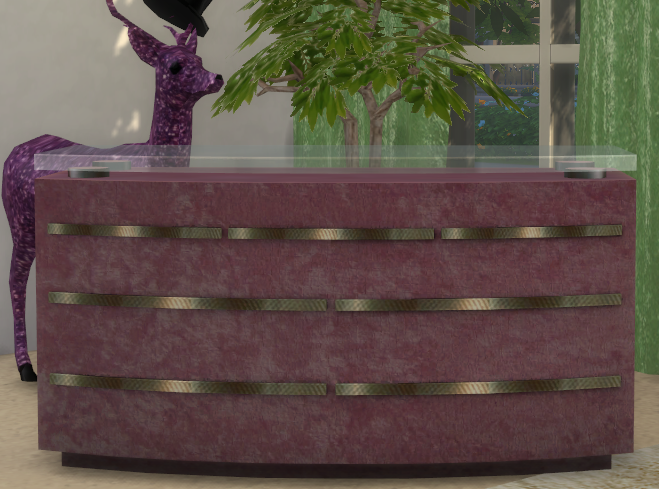 I had a good look at this and decided I could better, so I replaced the base and added two extra glass tints, green and purple. The base has three colours black, white and blonde wood. There are nine combinations each glass tint can sit on any colour base and vice versa. 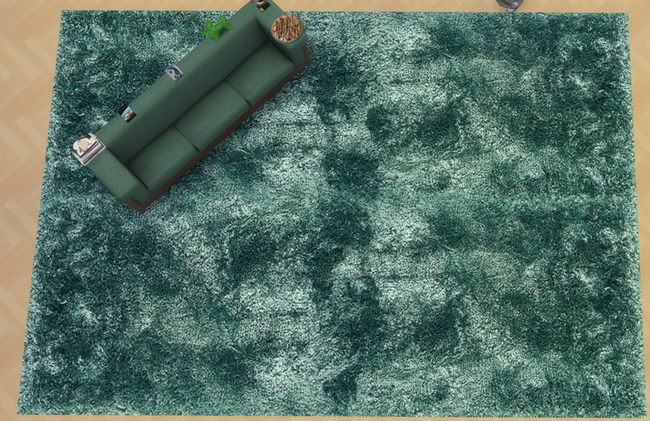 The improved spec gives the table a better definition and deeper sine. They fit in almost any room, I have them in bedrooms and basement labs. 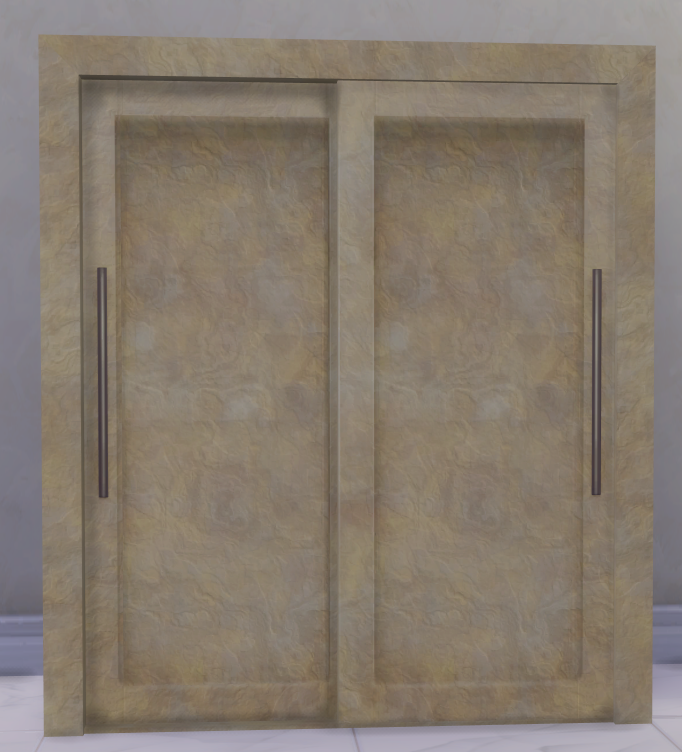 I changed the centre slot from large to medium and added four small slots around the edge. 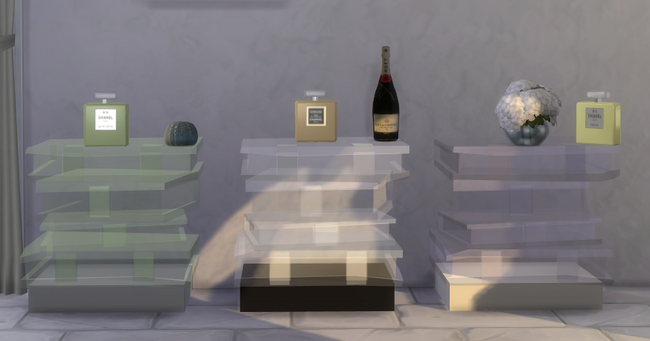 Credits for objects, hydrangea bouquet by Omorfi-Mera, pears and books by Mio Sims, candles by AOM (my all time favourite download), lamp by LeoSims (found this at last), Bed, book, pictures, rug, curtains, champers & chanel bottles and sea urchin me. 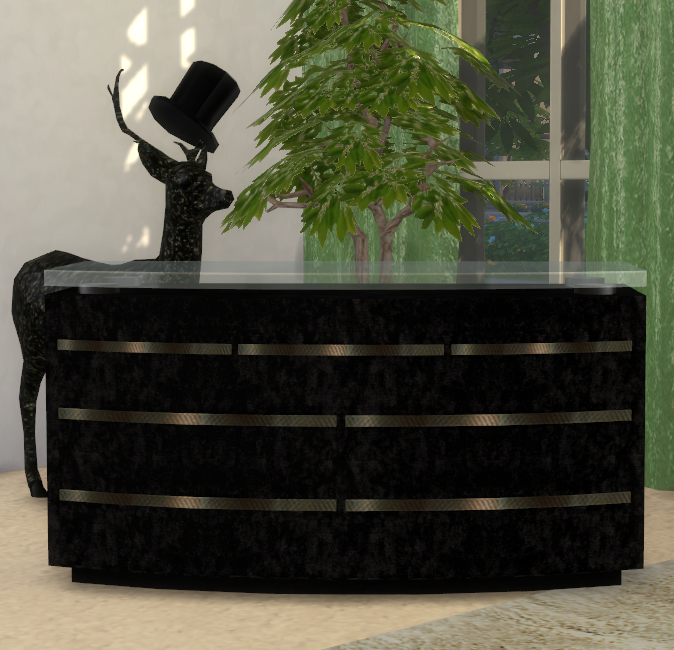 This dresser was recoloured and tweaked for the Round Bed (above p.2), but because the way the uv mapped the texture I was never happy with the lighting effect in game. I didn't know how to remap then, I do now. 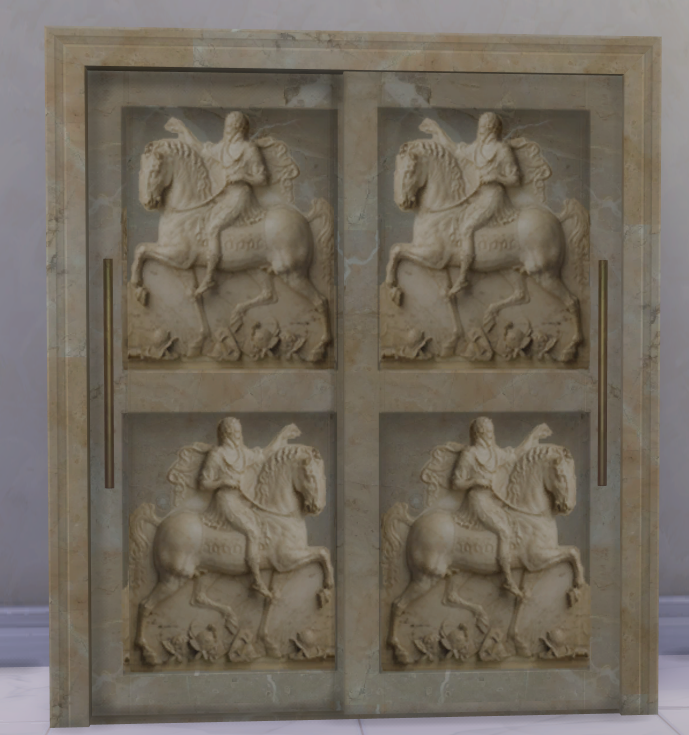 So I have remapped this and the texture looks and fits much better, I also adjusted the colours so there is a better match and sharper appearance. Its also a wee bit cheaper than the old one. This file can overwrite the old one. 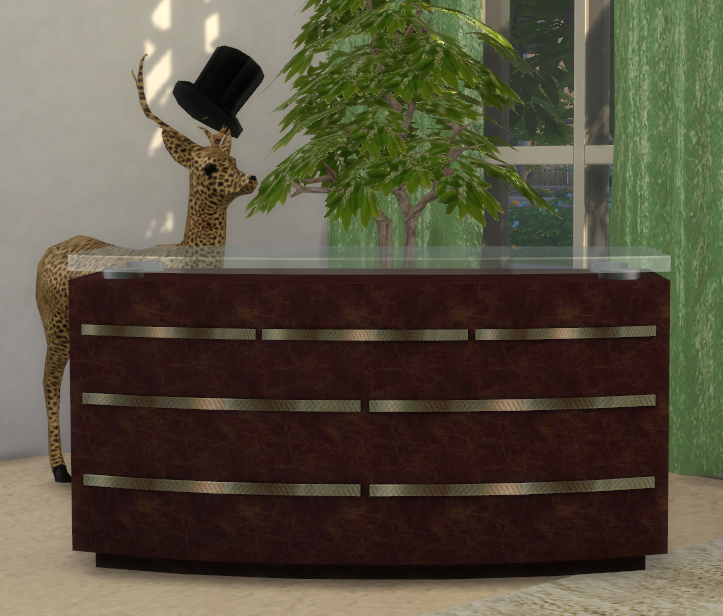 Credits; plant, Simcrediable designs, Deer, and all the other clutter, me. 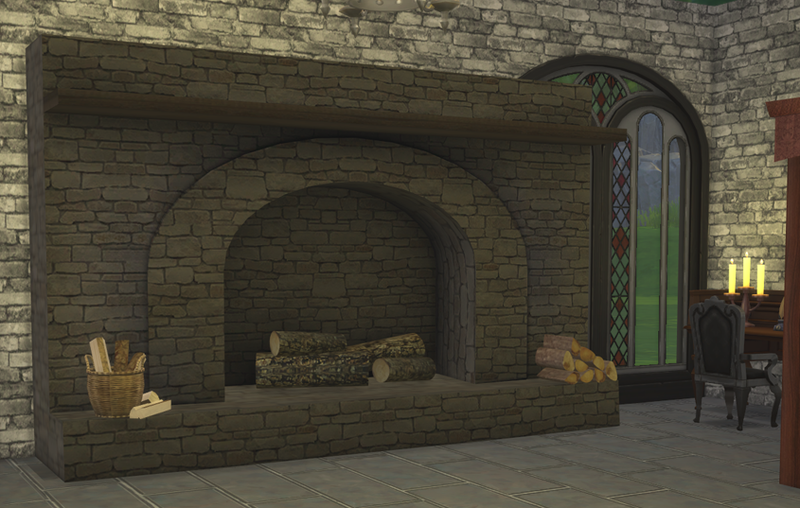 I was trying for a medieval hearth type of fireplace that belongs in a great hall. It's certainly big sitting nearly six tiles across. 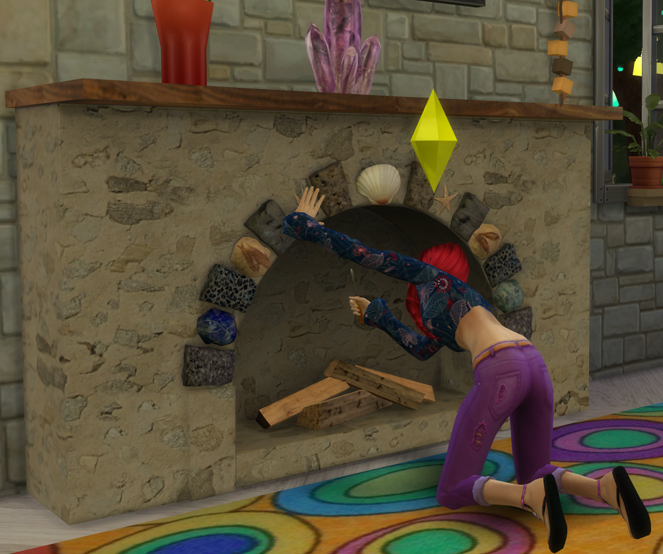 The first one was a moment of weakness I had been looking at river stone fireplaces and wanted to try one out. I guess we have always made use of the material around us so maybe there were river/beach pebble fireplaces back in the day. Lots of slots, 11 med and 14 small. £550. 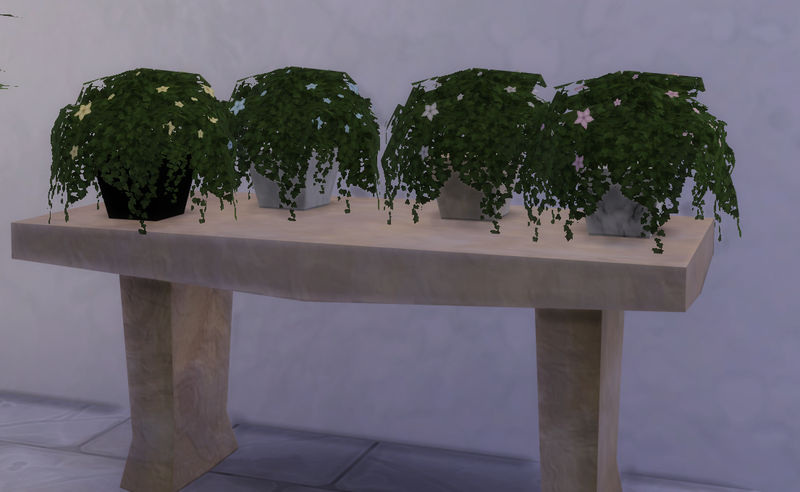 I meant to add that although this is big it does fit in rooms with the smallest wall height, I have been trying it out in a basement and it works quite well with stone walls and dim lighting. I really must do matching wallpaper. The mesh is mine made with Sims 4 Studio and Blender. 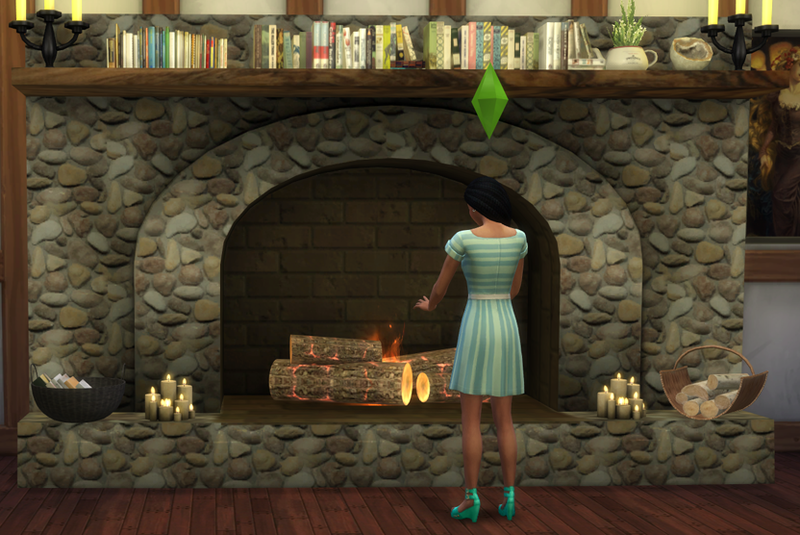 Credits, plants by SIMcredibale, Fire wood basket ,logs, books in a basket and books on shelves converted by Mio sims. Candles by AOM, found here. Teapot with herbs OrangeMittens. Glass by Serverinka. 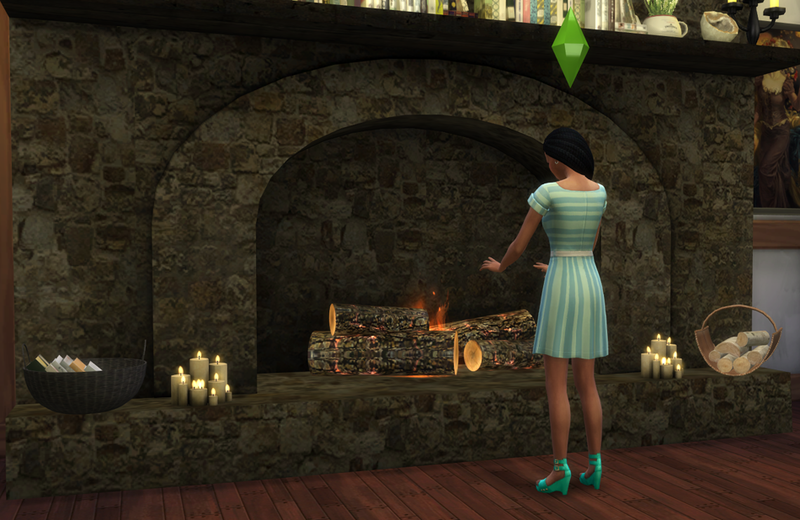 Any other bits are me and Maxis. 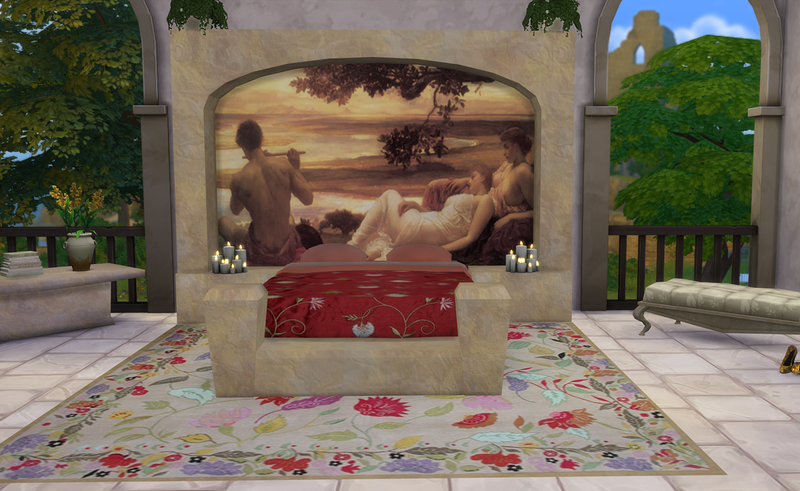 I made the first three of these to match the four poster bed above, I added another 3 because I thought a wider choice might be wanted. 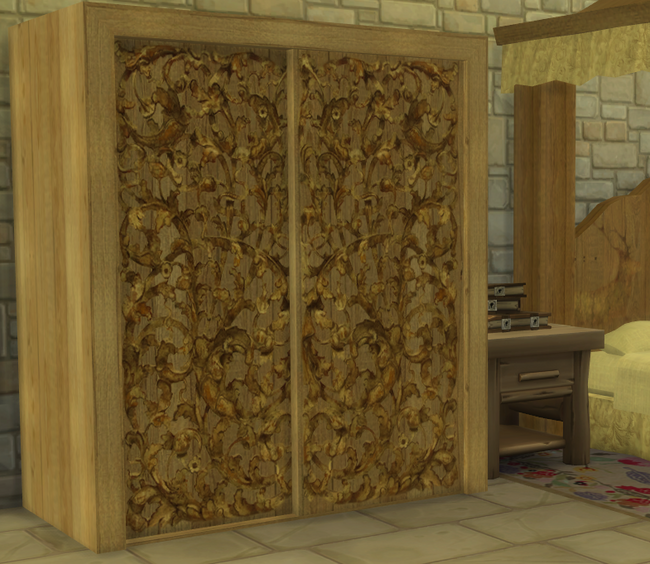 I haven’t just re coloured the wardrobe this time I took a lot of the things inside of it out. I knew that trainers and ties were not around back then so I tried to make the inside a bit more in keeping with the outside. I really don't know if I pulled this off, I'll let you guys be the judge of it. I did take pictures to try and show this but it was difficult to actually see inside on the left. 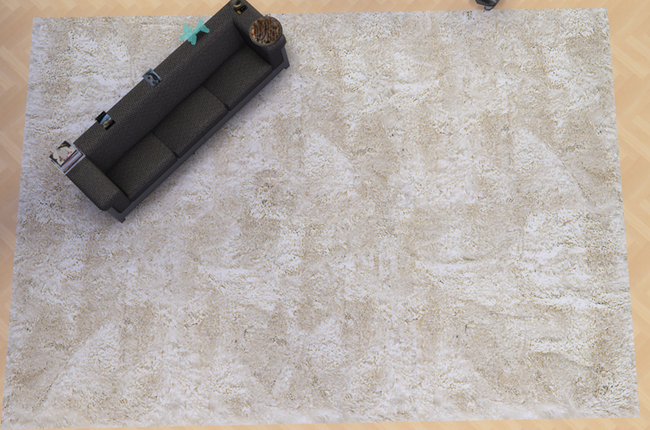 It did reduce the polycount from verts-2292 polys-1688 to verts-671 polys 392! Cabbage,fish and basket SimCrediable; Candles AOM. 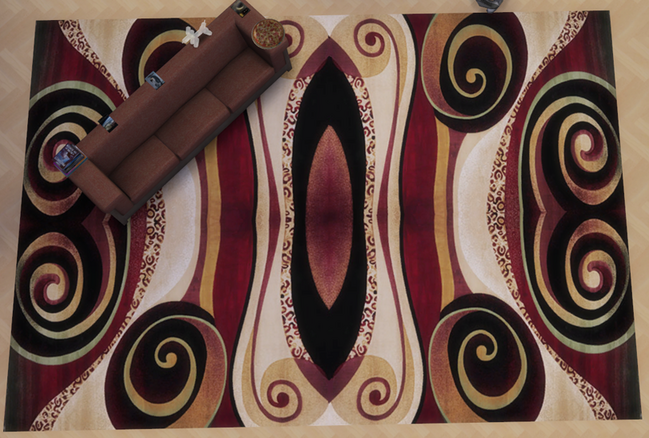 Rug, me. My attempt at letting you see the inside. The boxes have been replaced with baskets and the clothes with cloth/linens. The shelves are now wood. Summer is the time that collectors are out and about picking up anything that looks interesting. 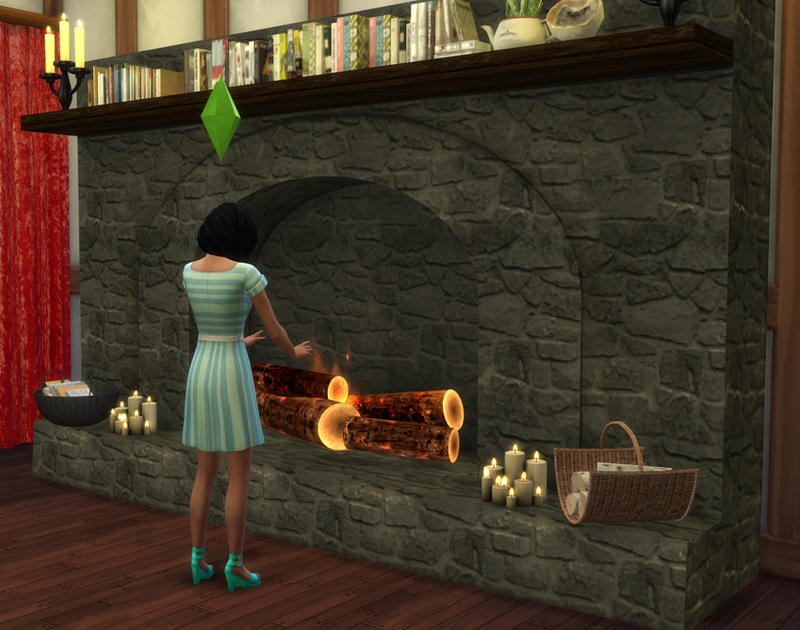 Here is a little set of collectors items starting with the fireplace. A great place to embed stones, rocks, fossils, drift and fossil wood. 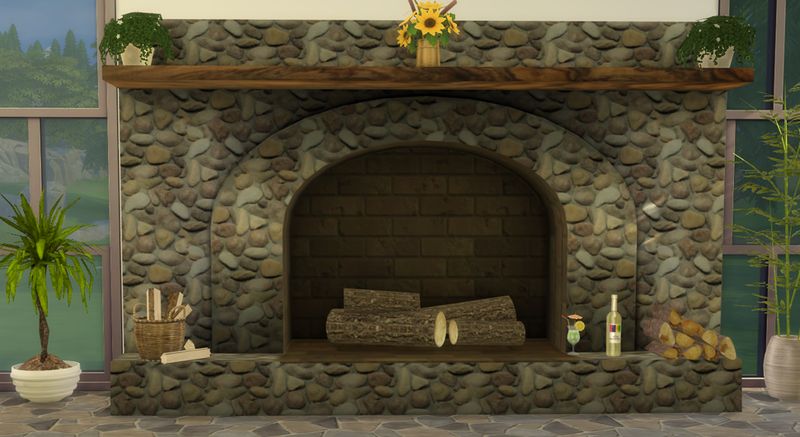 Three designs two different wood slab mantels with lots of slots. Found in deco £600. All clutter in pics me. I hope it comes in useful.